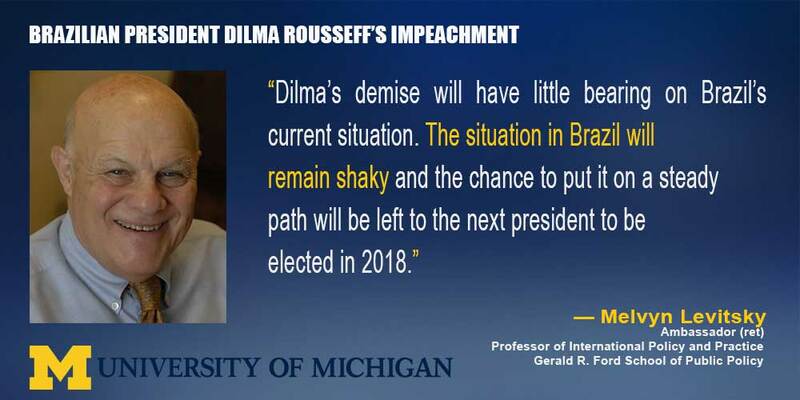 ANN ARBOR—Brazil is enduring its deepest political crisis in decades, as President Dilma Rousseff is impeached. Melvyn Levitsky, a former U.S. ambassador to Brazil and a professor of international policy and practice at the Ford School of Public Policy talks about outcomes for Brazil. Q: What can we expect to come out of the Brazilian Senate? A: At last count Dilma opponents were only two or three votes away from winning. She will be impeached. Q: What happens as she’s impeached? A: Chances are nothing more will happen to her after impeachment. She has not been implicated in corruption thus far, so unless something unexpected turns up, she will simply go back to being a private citizen. She could even run for office again as Fernando Collor did, after losing that right for eight years based on his corruption charges. Q: What’s next for the country? A: Brazil is in an extreme down period. I believe it will take several years for the country to get back on track. Reform of the political system is needed. Government spending has to be cut. New markets for Brazilian primary and manufactured goods need to be found. A rebound will also be dependent on an improving world economy. China is especially important to Brazil. Q: Can you comment on Michel Temer, who would take her place if Rousseff is impeached? A: Temer is just as unpopular as Dilma Rousseff. He will have difficulty putting together a majority coalition in the Brazilian Congress. The first days of his takeover have not been positive. Appointing cabinet members accused of corruption—and who had to resign—does not augur well for his efforts to govern. Q: Do you see a silver lining in the upheaval Brazil has gone through? A: One bright spot is that a younger group of public figures is beginning to emerge. Prosecutors, judges, and less-entitled political figures seem intent on cleaning up the corruption and promoting broader engagement and civic spirit into political and economic life in the country. 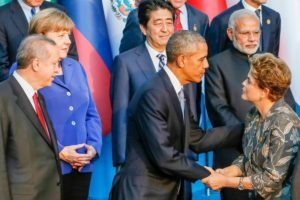 Brazil’s future depends on their success.